Home › Electronics › Rockjam 561 Electronic 61 Key Digital Piano Keyboard Superkit With Stand Stoo..
Rockjam 561 Electronic 61 Key Digital Piano Keyboard Superkit With Stand Stoo.. 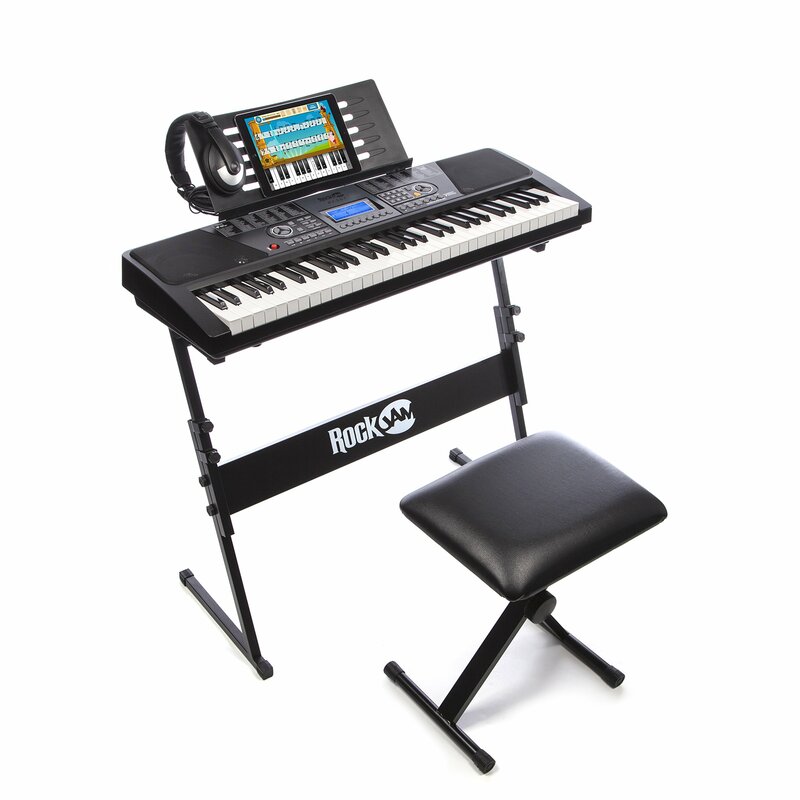 The RockJam 561 Super Kit includes a 61-key keyboard, a stand, an adjustablestool, and a pair of high quality headphones. It addition, the super kit comeswith 30 free Piano Maestro songs to be downloaded on your iPhone or iPad thatwill help aspiring musicians to learn and practice sight reading, rhythm,technique, two-handed playing, and much more (instructions and song listbelow). This intuitive keyboard comes with a power supply for use at home, butcan also be powered by 6 x 1.5V Size D batteries so you can take it on stageor on the road. The keyboard has a crisp LCD screen, and provides instructionsfor beginners, telling them which keys to press or chords to play while tryingdemo songs, making it the perfect keyboard for budding musicians. Although thekeyboard is compact, the keys themselves are full size. The sturdy andportable keyboard stand is a great way to ensure the keyboard’s stability, andis very easy to fold up and take on the road. The adjustable stool is acomfortable choice for pianists of all ages. The included over-ear headphonesenable pianists to play without disturbing anyone around them. And when aconcert is called for, the keyboard has built-in speakers that will fill theroom with rich, resonant sound. The keyboard also has a wealth of preloadedsound options, including 50 demo songs, 100 rhythms and 100 sounds. TheRockJam 661 kit comes with everything a pianist needs, and is an ideal giftfor beginners and advanced musicians alike. To activate this app with yourRockJam, download Piano Maestro on your iPad and register as a new user. Then,go to “Settingsâ€, “Select Your Pianoâ€, and choose RockJam from the dropdownmenu. The free songs will be available in the Library.